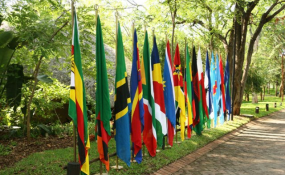 SADC countries flags (file photo). Pretoria — It is time the southern African region takes charge of its own narrative and tells the story about its major achievements and challenges. According to the Southern African Development Community (SADC) Executive Secretary, Dr Stergomena Lawrence Tax, for a long time the region "has been painted by stories of diseases, conflict, hunger and poverty." "But as a region, we have moved many steps in the positive direction. Today we are here to send a clear message that we have positive stories to tell," Dr Tax said while launching the second edition of the SADC Success Stories publication ahead of the 37th SADC Summit which opens 19 August in Pretoria, South Africa. Since its inception in 1980 as the Southern African Development Coordination Conference (SADCC), SADC has achieved a number of milestones aimed at advancing political and economic freedom. Major milestone include the launch of the SADC Free Trade Area (FTA) in 2008. By attaining the status of the FTA, consumers in the region are now getting better products at lower prices due to increased production, while producers are benefiting from a tariff-free trade for all goods originating within the region. On energy development, SADC has facilitated the establishment of the Southern African Power Pool (SAPP), where regional utilities are afforded the platform to sell and buy surplus electricity from each other, thereby helping some countries to meet their growing demand for energy. Latest SAPP figures show that cooperation through electricity trading among member utilities has seen the region moving from a power deficit situation a few years ago to surplus capacity of around 900 megawatts as of the beginning of 2017. With respect to political stability, the region has succeeded in consolidating peace and security in the region through various initiatives. These include peace mediation in countries where there have conflicts such as in Lesotho and Madagascar, as well as sending election observer missions, and providing troops to help SADC countries defend their sovereignty, as in the case of the Democratic Republic of Congo in 1998. Dr Tax said the regional media plays an important role in the integration agenda through educating and informing SADC citizens about the benefits of belonging to the Shared Community of southern Africa. She said "thanks to the dreams of our Founding Fathers," SADC is moving towards deeper regional integration and sustainable development. "I therefore encourage the media in the region to take pride and continue to disseminate these achievements," Dr Tax said. German Ambassador to Botswana and SADC, Ralf Andreas Breth concurred, saying SADC belongs to its citizens, hence it is critical for regional integration to benefit the people. "Southern Africa is a region of tremendous opportunities, and regional integration has great potential to improve people's lives in SADC Member States," he said. Breth said the SADC Success Stories publication is an innovative way to make SADC achievements visible for the people of the SADC region. The second volume of the SADC Success Stories was produced by Frayintermedia with support from German. The first edition of the publication, done by the Southern African Research and Documentation (SARDC), was launched in 2015 and, according to the SADC Secretariat, the publication reached more than one million people. The SADC Success Stories publication is one of the communication tools aimed at reaching out to SADC citizens to enhance awareness about the achievements and impacts of SADC programmes, actives and projects on communities and lives of the people in the region. The second volume of the SADC Success Stories covers a variety of achievements including those in various sectors such as agriculture, climate change, infrastructure, peace, tourism and water. The 37th SADC Summit is scheduled for 19-20 August and is running under the theme "Partnering with the private sector in developing industry and regional value-chains".